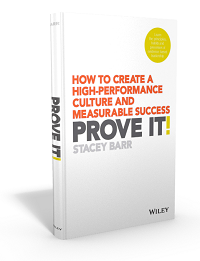 Many of us struggle to get the support and buy-in to establish a proper and deliberate performance measurement methodology in our organisations. The timing just isn’t right, or you just don’t have a compelling enough case yet. One way to get started is to practice your own advice, personally. This isn’t about setting up KPIs in your employee performance agreement. It’s about you applying your performance measurement methodology of choice on a result that’s personal to you. Choose a result that you want to improve. It might be to increase your speed at performing a specific task. It might be to reduce the hours you spend on rework or administrivia. It might be to increase the percentage of priority tasks you finish each week. Write your goal in measurable language. Deliberately design a measure for your goal that is direct evidence of it. Make sure your measure is quantifiable. Set up the habit of collecting the data routinely. Display your measure in a useful chart. Set a motivational target for your measure. Choose an improvement initiative to move your measure closer to the target. Focus on signals in your measure to work out if your improvement initiative has worked. Document your journey as a case study to help you build buy-in. There must be at least one improvement goal you have for yourself, or could set for yourself. Write it down, and then use the methodology you’re hoping your organisation will adopt to demonstrate how it works for you. Love you! Love your posts! Love how you are open to questions and differing opinions. All this to of course share a differing opinion. I cringe at “Set a motivational target for your measure.” Mostly because I worry over chasing data (numbers) and losing sight of the goal. But, I DO understand it. I do it too. Especially on n=1 measures – like weight, or number of pages written (working on a book), pages read, etc. I think the difference has to be that with the motivational number chase a few things make it OK.
1. You’re doing it as n=1. So no one else is trying to “motivate” you with numbers, you’re doing this to yourself. 2. You have to realize it is only a tool…and no where near the final goal. If you achieve a number (weight loss), but do it unsafely (sit in the sauna to lose water weight) it actually can work against the driving goal of being healthier. I’m sure there are others…but the key has to be that we don’t impose number chasing on others (n=1 is safe then), AND we don’t supplant the goal with the number target. We have to stay focused on the big picture, the prize, not the mile marker.